Description: Acting Governor States Recruiting Tour in Central Province, Gold Coast, 1917. Recruiting Durbar at Cape Coast Castle 17. Feb. 1917. Description: Acting Governor States Recruiting Tour in Central Province, Gold Coast, 1917. Recruiting Durbar, Cape Coast Castle 17. Feb. 1917. Part of Crowd. Description: Acting Governor States Recruiting Tour in Central Province, Gold Coast, 1917. Recruiting Durbar, Cape Coast Castle 17. Feb. 1917. 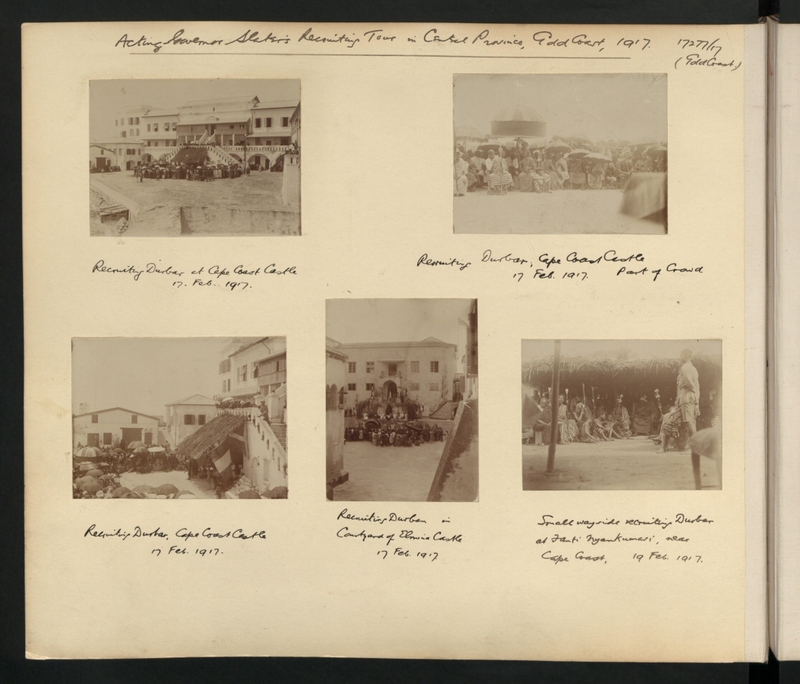 Description: Acting Governor States Recruiting Tour in Central Province, Gold Coast, 1917. Recruiting Durbar in Courtyard of Elmina Castle. 17 Feb. 1917. Description: Acting Governor States Recruiting Tour in Central Province, Gold Coast, 1917. Small wayside recruiting Durbar at Fanti Nyankumasi, near Cape Coast, 19 Feb. 1917.